Now that I've finished my jumper I'm back to working on toys. 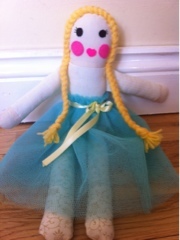 First on the list is a small rag doll for one of Emily's friends - it's her birthday tomorrow. Very girly, but she's quite a girly girl! I was going to post about how I connected with my domestic goddess and baked muffins this morning but as it is my 100th post I thought I would share a pattern with my readers. This is Piggywig. I only started him this afternoon so he is a super quick knit if you needed a present in a hurry. He's about 12cm tall. You'll need straight 2.75mm needles, a darning needle, some polyester stuffing and oddments of yarn in pink, blue, green, cream and black. Gauge is not too important - I knit at about 9sts:10rows:1 inch - just make sure that your knitting is nice and tight so the stuffing doesn't show through. Using pink, cast on 30 sts. Mark the centre of the cast on sts. Next row: Inc K-wise into every st - 60 sts. Beginning with a P row, st-st 7 rows. Next row: (K2, K2tog) to end - 45 sts. Break off pink and join on blue. Beginning with a K row, st-st 10 rows. Mark the centre of the last blue row. Break off blue and join on green and cream. Okay, I know I've gone off the boil recently in terms of getting new patterns out. I just seem to be constantly busy. Doing what, I do not know! They're only about 3 inches high and don't take long to knit at all. 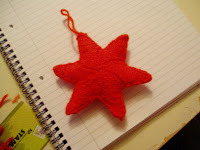 Decided to try to make a star this evening. Starting for Christmas very early this year! Had originally intended a 5-point star but it turned out better as a 6-point. It only took me about 2 hours max so I decided to share the pattern. Row 1: K1, K2tog, K5, Inc K-wise into next st, K1 - 10 sts. Row 2: P1, Inc P-wise into next st, P5, P2tog, P1 - 10 sts. Repeat these two rows 3 more times. Arrange the diamonds in a circle with cast on edges all facing the same direction. From the 12 diamonds, you should end up with two stars each consisting of 6 diamonds sewn together. With right sides to outside, oversew across all outside edges, stuffing lightly as you go. (Initially I sewed it together with right-sides together to hide the seam but it meant that the points weren't as sharp). Sew a small loop to the end of one point.